Although several studies have reported an association between mental disorders and serum levels of brain-derived neurotrophic factor (BDNF), this association is still poorly understood. The study of factors associated with both BDNF levels and mental disorders, such as n-3 polyunsaturated fatty acids (n-3 PUFAs), may help to elucidate the mechanisms mediating the relationship between the two variables. Therefore, the present study aimed to evaluate whether the intake n-3 PUFAs correlates with serum levels of BDNF. This study involved 137 adolescents drawn from a community sample, including a group with high levels of anxiety, assessed using the Screen for Children and Anxiety Related Emotional Disorders. Blood samples were collected and serum BDNF levels were measured. n-3 PUFAs were estimated using a food frequency questionnaire for adolescents. Correlations were performed to assess the association between n-3 PUFAs intake and BDNF levels. Effects of potential confounders (total fat consumption, age, gender and anxiety) were examined using linear regression models. There was a direct correlation between n-3 PUFAs consumption and serum BDNF levels, which remained significant even after accounting for potential confounders. We were able to detect a correlation between n-3 PUFAs intake and peripheral BDNF levels. Our study was limited by its small sample size, and our external validity may be restricted by the oversampling of anxious adolescents. Our findings may help determine the nature of the association between mental disorders and serum levels of BDNF. However, more studies are needed to elucidate the possible mechanisms by which n-3 PUFAs intake affects BDNF levels, and how this may lead to an increased vulnerability to psychiatric disorders. Brain-Derived Neurotrophic Factor (BDNF) is a dimeric protein thought to be involved in neuronal survival and synaptic plasticity, and to be an important biomarker for psychiatric conditions such as depression and bipolar disorder[1–3]. It is a member of the growth factor family and acts as a regulator of synaptic plasticity, synaptogenesis, as well as neuronal survival and differentiation[4–6]. Therefore, the understanding of processes associated with both BDNF levels and mental disorders may ultimately help determine the underlying mechanisms responsible for the association between these two variables. Studies of human subjects have demonstrated that lower per capita fish/seafood consumption, which can be used as a surrogate measurement of n-3 polyunsaturated fatty acids (PUFAs) dietary intake, is associated with a higher prevalence of bipolar spectrum disorders[7, 8], major depression[9, 10] and postpartum depression[11, 12]. Experimental studies in rats demonstrate that polyunsaturated fatty acids (PUFAs) could modify brain BDNF levels[13–15] and may play an important role in the function and structure of many membrane proteins[16, 17]. Nevertheless, there is still a need to investigate whether the relationship between dietary n-3 PUFAs intake and BDNF translates to humans. In light of these above findings, the aim of the present study was to evaluate whether the consumption of n-3 PUFAs correlates with serum BDNF levels in humans. The current study involved 137 adolescents drawn from a community sample, including a group with high rates of anxiety (64.6% female; mean age 13.9 years, SD = 2.42), as assessed by the Screen for Children and Anxiety Related Emotional Disorders (SCARED). A detailed description of the sampling process can be found elsewhere. Briefly, all quartiles of the distribution of SCARED scores were equally represented in the sample (i.e., no to very low anxiety, mild anxiety, moderate anxiety and severe anxiety), although there was an oversampling of participants in the upper quartile (severe anxiety). The SCARED inventory comprises 38 items that can be grouped into subscales according to the different anxiety symptoms investigated, and consists of a screening tool for DMS-IV childhood anxiety disorder. The present study was approved by the Research Ethics Committee of the Hospital de Clínicas de Porto Alegre (GPPG/HCPA, protocol number 08–481). Informed consent was provided by all primary caretakers, and all adolescents assented to participate in the study. Blood samples were collected between 7 and 10 am after a fasting period of 10–12 hours, centrifuged for 5 minutes at 4500 rpm, and serum was stored at −80°C in order to measure BDNF levels. All BDNF measurements were performed on the same day by sandwich-ELISA using monoclonal antibodies specific for BDNF (R&D Systems, Minneapolis, Minnesota), according to the manufacturer’s instructions. The intra-assay and inter-assay coefficients of variation were 3.7 and 8.5%, respectively. n-3 PUFAs intake was estimated by a food frequency questionnaire administered to the adolescents (FFQ). The quantitative analysis of macro and micronutrient intake was performed using the NutriBase® software (Version NB7 Network) [Phoenix, AZ, USD]. Spearman correlations were performed to assess the association between n-3 PUFA intake and BDNF levels. The effects of potential confounders (total fat intake, age, gender and symptoms of anxiety) were examined using linear regression models (involving log-transformed BDNF values, logBDNF). The correlation between n-3 PUFA intake and BDNF levels was statistically significant, rs = 0.172, p = 0.043 (Figure 1). 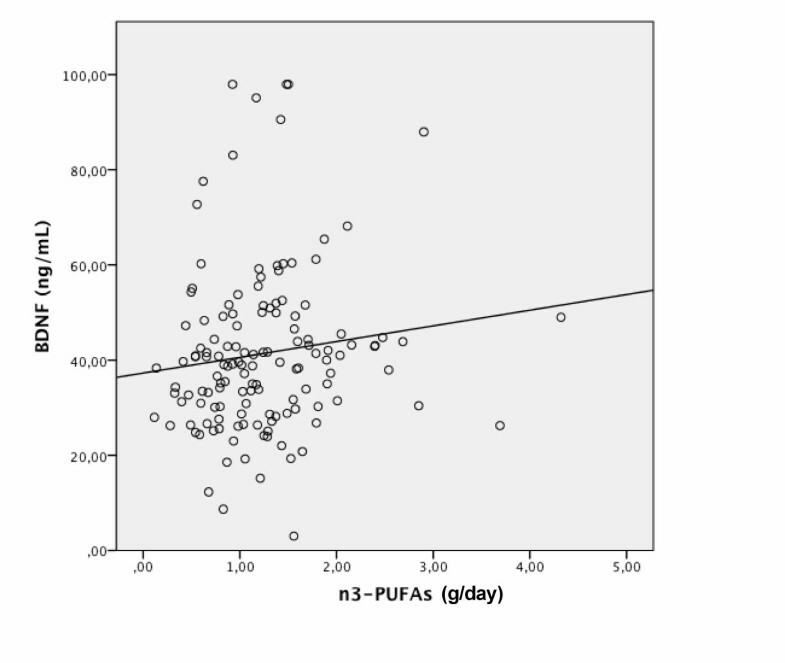 Multivariate linear regression models showed that even after controlling for the confounders, n-3 PUFA intake was associated with higher levels of logBDNF (beta = .463, t = 2.83, p = 0.005). No evidence of collinearity was found in the model. Correlation between n-3 polyunsaturated fatty acids (n-3 PUFAs) intake (g/day) and peripheral levels (ng/mL) of brain-derived neurotrophic factor (BDNF). The correlation between n-3 PUFAs intake and BDNF levels was statistically significant (rs = 0.172, p = 0.043). We were able to show that n-3 PUFAs intake is associated with serum BDNF levels in adolescents, corroborating to the suggestion that the relationship between mental disorders and BDNF may be mediated by the intake of nutrients such as n-3 PUFAs. This may influence the cellular and physiological processes involved in psychiatric/mood disorders, such as the fatty acid composition of cellular membranes, the modulation of behavioral systems, neurodevelopment, and oxidative stress in specific brain areas[21–25]. Studies suggest that n-3 PUFA-depleted rodents exhibit changes in emotional status such as elevated aggression, depression and anxiety[26–31]. Moreover, the dietary deprivation of n-3 PUFAs in rats may lead to changes in the expression of BDNF in the frontal cortex, in cAMP response element binding protein (CREB) activity and reduce p38 mitogen-activated protein kinase (MAPK) activity. It is noteworthy that the food frequency questionnaire used in the study contained a varied list of 94 foods or drinks[20, 32]. Thus, the corresponding food sources to the n-3 PUFAs consumption among students were diverse, including vegetable oils and products/preparations based in oils (e.g. biscuits, mayonnaise and fried foods), according to calculations performed with the values depicted in the American Food Table. Besides fish and oils consumption, red meat is also considered a source of n-3 PUFAs, and our region is especially known to have a high consumption of meat. A national survey conducted in both urban and rural areas throughout the country with analysis of individual food consumption in Brazil from 2008–2009, reported that the Southern region of Brazil, including the State of Rio Grande do Sul, where the city Porto Alegre lays, was identified as one of the leading regions in the consumption of red or pork meat. Besides, it was also observed that among 10 to 13 years old population, the n-3 PUFAs displayed a high daily consumption (mean: 1.5 g) in this region, compared to other Brazilian regions. Meat intake is traditionally high and typical from our region, which could probably corroborate to the high n-3 PUFAs consumption levels evidenced in this study. It is important to note that our study is limited by its small sample size, and that the oversampling of anxious adolescents may restrict our external validity. However, in spite of these limitations, we were able to detect a correlation between n-3 PUFAs consumption and serum BDNF levels. The extent to which peripheral BDNF levels are representative of central nervous system BDNF levels remains to be investigated, although positive correlations between serum and cortical BDNF levels have been reported in preclinical studies, and cellular and behavioral brain functions have been found to be modulated by peripheral BDNF. Furthermore, serum BDNF levels have been associated with neuronal integrity in healthy subjects and decreased BDNF peripheral levels (i.e. serum or plasma) have been consistently found in patients with mood disorders[39, 40]. BDNF is implicated in a variety of neural processes and is related to neuronal developmental stages in both animals and humans. Lang, Hellweg, Sseifert, Schubert and Gallinat, 2007 reported that serum BDNF protein concentrarion might reflect some aspects of neuronal plasticity in the living human brain, playing a role as regulators of neuronal survival and differentiation. Similar findings have been reported by Poo, 2001. Recent studies demonstrate that decreased peripheral BDNF levels are consistently related to disease activity and progression in bipolar disorder as well as to the cognitive impairment seen in patients following their first psychotic episode. More studies are needed to elucidate the possible mechanisms by which n-3 PUFAs consumption affects BDNF levels and influences the vulnerability to psychiatric and mood disorders, especially during certain life stages such as adolescence. Screen for children and anxiety related emotional disorders scale. We thank the children and families for their participation. Without them, this research would not have been possible. We also thank the research teams of the Centro Colaborador em Alimentação e Nutrição Escolar (CECANE – UFRGS) and the Fundo Nacional para o Desenvolvimento da Educação do Ministério da Educação (FNDE). CNPq, FIPE-HCPA and FAPERGS provided the funding for the clinicians and interviewers involved in the study, and for the purchase of all necessary materials. CAPES (CFF and GAS), FAPERGS (GAS) and CNPq (FK, PPS, CD, GGM, MZG) provided scholarships to the researchers. No funding agencies participated in the execution of the present study, including data collection, analysis and manuscript preparation. Charles Francisco Ferreira is a CAPES scholarship recipient and declares no potential conflicts of interest. Giovanni Abrahão Salum has a CAPES/FAPERGS post-doctoral scholarship and declares no potential conflicts of interest. Vera Lúcia Bosa and Ilaine Schuch declare no potential conflicts of interest. Flávio Kapczinski, Patrícia Pelufo Silveira, Carla Dalmaz, Gisele Gus Manfro and Marcelo Zubaran Goldani have received research grants from Brazilian government institutions (CNPQ, FAPERGS and FIPE-HCPA). All authors participated in the study to a significant extent. CFF, JRB, GAS, CD, GGM, PPS worked on data analysis and interpretation, in writing the manuscript and contributed to the intellectual content of the article. VLB, IS, MZG, FK, GAS, GGM and PPS worked on study conception and design, as well as data collection and interpretation, and made intellectual contributions to the article. All authors read and approved the submitted manuscript.